Reed et al. (2010) revealed that Hunter et al. (1991), Friedkin (1998), Stevenson and Greenberg (2000), Katz and Lazarsfeld (2006), and Winter et al. (2007) put forth the idea that additional current writings on social networks reveals the way webs impact people’s judgment and views. Reed et al. (2010) revealed that Erickson (1988) puts out the concept that this impact can happen on an individual-to-individual origin across social collaboration. Reed et al. (2010) further point out the concepts from Coleman (1990) and Prell et al. (2010) that impact across webs ends from the bigger net format in which roles are entrenched. Comprehension may transpire over two essential kinds of social collaboration: data transport, i.e., easy comprehending of authentic truths over social collaboration, and discussion (Reed et al., 2010; Newig, et al., 2010). Sherif, Munasinghe, and Sharma (2012) performed a study that found electronic open networks have a greater impact on the format and mental areas of social resources. 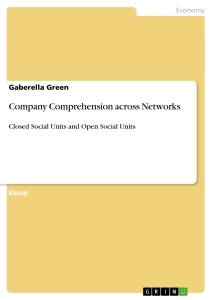 Open social networks and closed social networks aim to gather social assets. - Sherif, Munasinghe, and Sharma (2012) put forth the idea that closed social units and open social units can establish authentic knowledge. - While associates are linked to a bigger amount of people in the web, they have a greater capability to obtain data of optimum amount and superiority at a less bordering price than in a constrained closed linkage (Sherif, Munasinghe, & Sharma, 2012; Griffith et al., 2003; Ahuja et al. 2003). The ideas of merged associations and completeness steer to another area of general systems theory (Voigt, 2006). As cited by Voigt (2006), Bertalanffy (1969) that a process can be termed as a group of factors erecting in merged affiliations. Processes that interconnect or collaborate with their atmosphere are open processes. The ones that do not are closed processes. The processes of general processes concept constantly correlate with their atmosphere. These processes are in impact a piece of a bigger process. Thus, they are open rather than shut processes (Voigt, 2006). Data and comprehending may be in truth an origin of the arrangement of open practices that advance to the known name steady condition. Open approaches that lean to optimum heights of arrangement in this manner can be mentioned to reflect self-arranging processes (Voigt, 2006). Voigt (2006) pointed out that Bertalanffy (1969) stated that these are processes organizing themselves by manner of advancement variation, developing from conditions of low to conditions of greater complexity (Voigt, 2006; Bertalanffy, 1969). Sherif, Munasinghe, and Sharma (2012) argued that Powell et al. (1996) revealed that the capability of constituents of a firm to gain from an electronic intercompany open web or a closed relational association net relies on the role a participant holds on the network and the gathered social assets a participant can approach (Sherif, Munasinghe, & Sharma, 2012; Powell et al., 1996). Electronic open webs are contact linkages that connect people through place, period and company barriers. The links created among associates in open nets are adjustable lame connections that are reconstructed founded on data-maneuvering essentials (Sherif, Munasinghe, & Sharma, 2012; Ahuja & Carley, 1999; Gargiulo & Benassi, 2000). Closed interrelation-oriented connections, in another way, are links where every associate are connected across interrelated social links. The strengths of these bonds are perceived to offer a normative atmosphere generated with optimum points of belief and collaboration (Sherif, Munasinghe, & Sharma, 2012; Coleman, 1990). Reading Comprehension "Terrorism - a war without borders"
Social Networks - Blessing Or Curse?